Dermabrasion is one of three commonly used office-based surgical skin resurfacing and rejuvenation procedures. The technique takes its origin from ancient Egypt in 1500 B.C. where healers used a form of sandpaper to even out scars. Today the technique has seen over 3500 years of evolution. Dermabrasion mechanically removes the most superficial layers of the skin and allows your skins normal healing properties to rejuvenate the skin itself. It is designed to reduce or remove moderate wrinkles, fine lines, skin blemishes, and uneven skin surfaces. In addition to wrinkle treatment, the technique has been used to treat acne scars, hide or camouflage surgical or traumatic scars and in select cases to remove precancerous lesions. Microdermabrasion is not the same treatment as dermabrasion and will not be discussed further than this paragraph. Microdermabrasion is a much more superficial and thus a less dramatic rejuvenation procedure with little to no recovery period. Being a more mild procedure than dermabrasion, multiple treatments of micordermabrasion are often required and may never achieve the same degree of rejuvenation as traditional dermabrasion. Microdermabrasion uses a device that sprays a fine beam of aluminum oxide microcrystals to superficially peel the skin surface while simultaneously removing the tissue debris. As microdermabrasion is not as invasive a procedure, non-medical personnel offer this treatment through many spas and clinics. 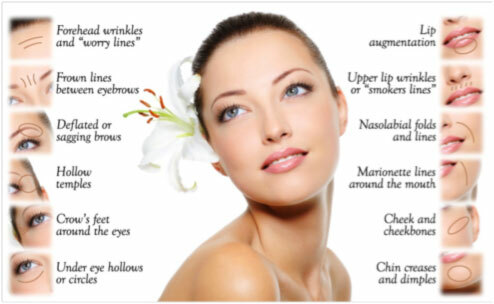 Skin rejuvenation can also be performed with lasers or chemical peels. These modalities will not be discussed in this section. The use of fillers and Botox® will be discussed in other sections in the guide. Patients with darker skin complexions (Fitzpatrick skin types III to VI) may experience permanent skin discoloration or blotchiness with dermabrasion procedures. Patients of African, Asian and Hispanic descent should specifically be cautioned about skin discoloration. Patients with a history of oral herpes infections should be placed on oral acyclovir prior to this treatment to avoid a herpes flare or extension of the condition following dermabrasion. 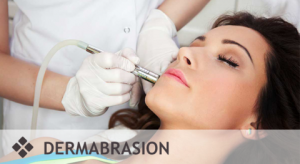 Dermabrasion is performed in an out-patient (often office) setting under local anesthesia. Full-face dermabrasion is performed under conscious sedation or general anesthesia, often with the assistance of an anesthetist. A small motorized hand piece rotates a wire brush or diamond fraise at speeds of 15,000 to 30,000 rpm. Skilled manipulation of the rotating brush or fraise removes the upper layers of skin in the areas requiring treatment. This results in a raw, open, partial thickness (through skin) wound that heals by epithelialization of the surface of the skin in a relatively short period of time. Initially the small pinpoint bleeding of the raw wound may be alarming but will subside rapidly with appropriate wound care. The recovery following dermabrasion skin resurfacing is approximately 2-3 weeks. Early post-operative pain is controlled with prescription medications for the first few days. Most patients require only over-the-counter medications or are comfortable without pain medication within days of the procedure. The skin may weep for the first 10-12 days but eventually stops as the surface layers of the skin are restored. Redness of the treated area is a normal part of recovery and disappears within 3-4 weeks of the procedure. Complete sun avoidance on the treated area must be observed until the redness in the skin has disappeared. Remember good sun protection should still be observed well after the healing period, as it was likely the sun damage to your skin that has driven you to seek this form of treatment in the first place. Make-up can be used to cover the early skin discoloration once the skin has healed. Please ask your physician or surgeon for directions on when make-up can be used safely. For a more detailed discussion on expected results, recovery, and specific complications, please see your individual surgeon. Dermabrasion procedures are not covered under the Canadian Medical Services Plan and the final cost for such procedures will be at the discretion of the plastic surgeon performing the procedure. Most surgeons quote costs based on the number of aesthetic areas being treated. The average cost of this procedure, is $1000 and higher. This website does not cover all of the medical knowledge related to dermabrasion nor does it deal with all possible risks and complications of skin resurfacing procedures. Although it is designed to provide the patient with greater depth of information in some areas, it is not intended to substitute for the in depth discussion between patient and surgeon that must occur prior to any surgical or treatment procedure. For a more detailed discussion on expected results, recovery, and specific complications, please see your plastic surgeon or dermatologist.